Organise Gmail Emails with Folders Organise Gmail Emails with Folders – MillionClues! I got a sneak-peak into some of Gmail accounts (na, I didn’t hack). I saw that they were using labels to sort their emails; did you know that you could organize emails into folders? I had touched this earlier, but didn’t go into the details. Suppose you wish to sort all notifications and updates from your blog into a folder. 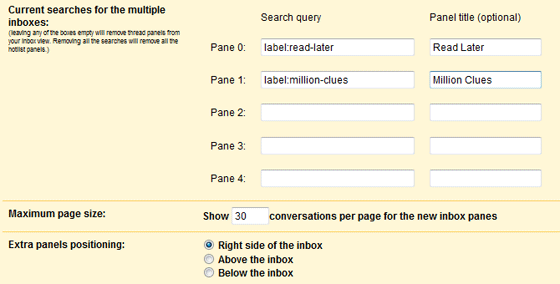 Start with making a filter.You will find the link to create a filter near the search box. Now in the subject box enter some unique text that all mails from your blog have in its subject line. Almost all emails from my blog (emails from contact form, new comment notifications, comment moderation notification, database backup, Google Analytics reports) carry the blog name in it. Click Next Step and you will get more options like shown below. The most important one here is to select Skip the Inbox (else it won’t make much difference). Apply a Label – Create a new one and name it Blog or your blogs name. Click on Create Filter. Now you will have a link with the name of your filer in your sidebar. All emails from your blog will not go to your inbox, but will stay here. Now you can keep your work separate from personal emails separate from subscriptions etc etc. The Labs tab under Settings has an interesting utility called Multiple Inboxes. Enable it and save, you will see a new tab in your Settings named Multiple Inboxes. Here you can specify up to 5 additional panes (apart from your main inbox) and choose how you want to see them, either one on top of other or side by side. Very informative post to read and i usually dont comment on the blogs but your post was very intresting to read and i would like to thank you and please keep posting blogs like this, thanks. I didn’t know that part of Multiple inboxes, glad you shared it. Anyway, sometimes the filter I created doesn’t put the mail in the correct folder. What can I do in order to fix my filters?